Anonymous 3 months, 2 weeks ago. Here is the much awaited Nougat 7.0 ROM for Galaxy NOTE 3 CM14 (CyanogenMod 14). We also have the Lineage 14.1 for Galaxy NOTE 3. For latest updates, stay tuned to the Lineage OS device list page. Since Google released Android Nougat Source code, we have update many Android NOUGAT AOSP ROMs and also many CyanogenMod 14/CM14 ROMs updated and many are yet to come. This Galaxy NOTE 3 CyanogenMod 14 is brought to you by developer Trader418. Another build brought to you by christer12. If you like christer12’s ROM then consider donating christer12 via PayPal and donate to Trader418. 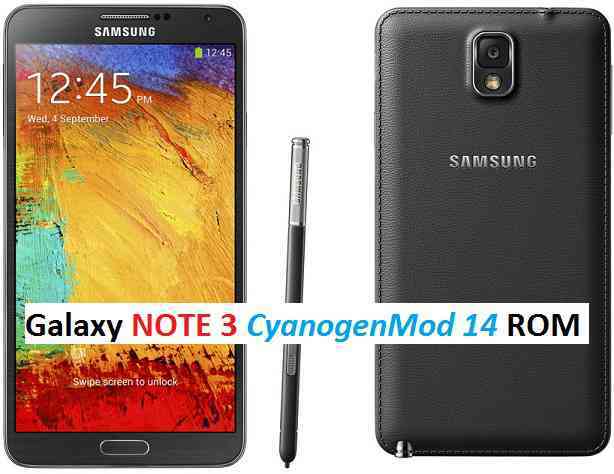 Download and Copy the GApps and Galaxy NOTE 3 CyanogenMod 14 ROM ZIP to your phone. Reboot and Enjoy the CyanogenMod 14 Nougat ROM on Galaxy NOTE 3. Copy the latest Galaxy NOTE 3 CyanogenMod 14 ROM ZIP file to your phone. Complete the initial setup and enjoy Android Nougat 7.0.0 with CyanogenMod 14 for NOTE 3 (SM-n9005). Stay tuned or Subscribe to the Galaxy NOTE 3 forum For other Android Nougat ROMs, CyanogenMod 14 ROMs, other ROMs and all other device specific topics. For the development link of Galaxy NOTE 3 CyanogenMod 14 Nougat ROM Update, visit Trader418’s thread here and christer12’s thread here. I’ve flashed the rom on to a verizon note 3. Everything is working except for mobile data. There’s no APN problem as I know. Are there any solutions. I’m using this on a GSM network. calls and sms work flawlessly. Yeah the Mobile data seems to be a BUG as of now. Stay tuned to this thread for the latest ROM and see if it is addressed in the latest one. Try christer12’s CM14 build for NOTE 3 and let us know if the Data is fixed in his build or not !!! I tried the christer12’s rom. Cellular data works fine(on n900v). Others complain about battery life. but I didn’t spend enough time to monitor battery life or other issues. So far it’s fine. Yeah works fine, but experiencing wifi issues after a while. I just installed this, so thanks for helping me revive my Note 3! Bluetooth seems to have issues. My headset, an LG HBS 760 is not discovered, neither are any other devices. Any improvement to be expected, or something I can do? My Note 3 with LineageOS 14.1-20170212 Bluetooth won’t work at all.